First For The Perth Mint! 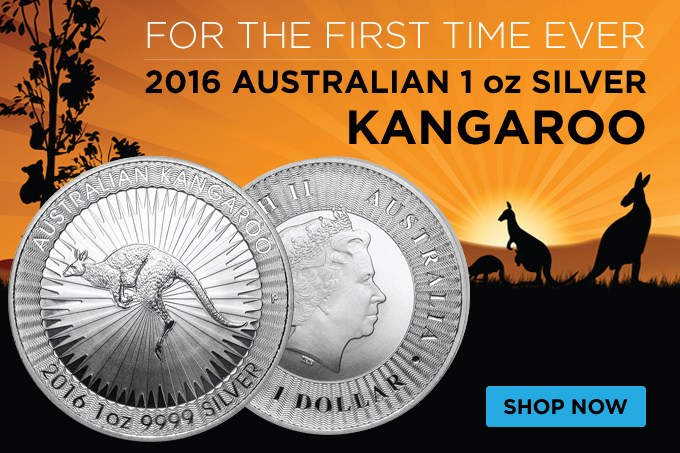 2016 Australian Silver Kangaroo coins are this year’s hot new product. While you may be confused because collector Kangaroo coins already exist, this new coin is poised to become Australia’s official bullion coin. Much like the Silver Eagle is the United States’s bullion coin and the Silver Maple Leaf is Canada’s coin. The Silver Kangaroo is poised to become Australia’s silver bullion coin. 2016 Australian Silver Kangaroos come in tubes of 25 and Monster Boxes of 250 coins. Get your hands on the newest silver bullion coin today!